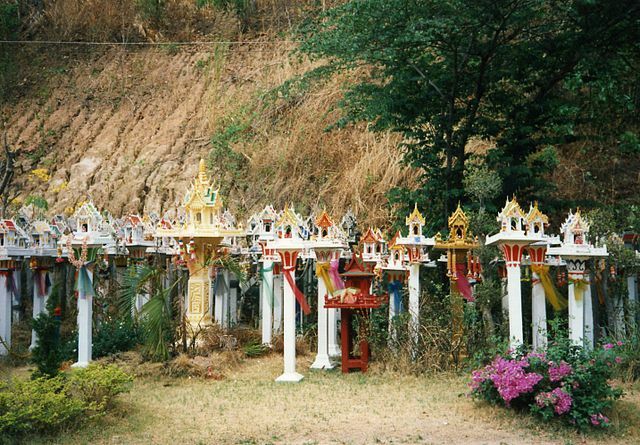 If you’re familar with Thai culture, you know that belief in ghosts and the supernatural is very prominent. Thus, supernatural beings can be divided into two main groups which are the benevolent and the malevolent spirits. The benevolent spirits are primarily guardian spirits, for instance the guardian spirit of the village proper and the numerous territorial spirits which are the spirit of the forrest (Chao Pa), the spirit of the hills and mountains (Chao Khao), the rice goddess (Mae Phosop), Kuman Thong (กุมารทอง), the spirit of young children and Mae Sue (แม่ซื้อ),the guardian goddess and female ghost of infants. 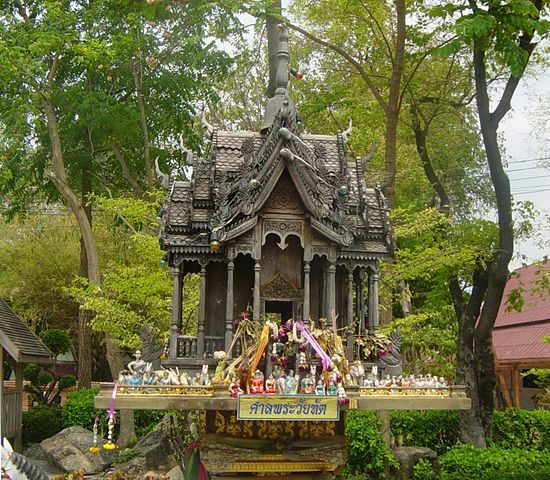 A very well-known spirit in Thai culture is the ghost of the house compound which is called Phra Phum. 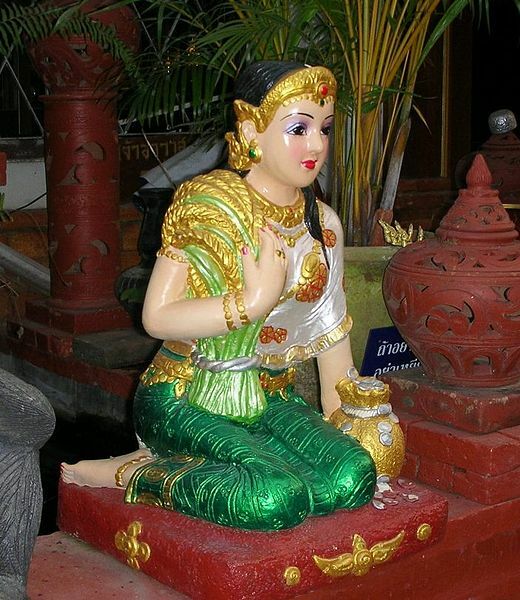 Every Thai house and building has a guardian spirit that lives in the spirit house in front of the respective house. The group of benevolent spirits also include the heaven spirits of Thewada which are usually referred to collectively. Malevolent spirits cause trouble to people and aim at harming them. Most often these evil spirits are supposed to be the spirits of people who died violently or accidentally. It is a common belief that if a person dies violently or suddenly, his spirit wanders around in this world since it still aims at fullilling its role in this world. 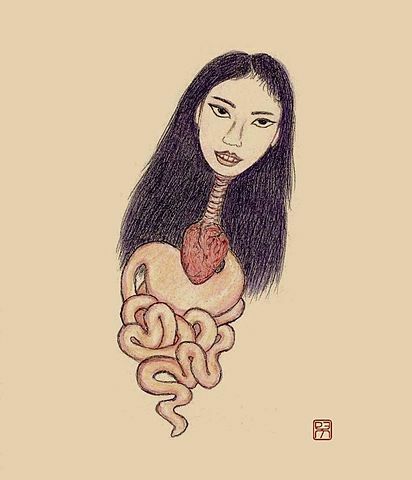 However, there are also other kinds of bad spirits like Phi Pop (ผีปอบ, a malevolent female spirit that devours human entrails, Phi Krasue (กระสือ, a woman’s head with her viscera hanging down from the neck) and Phi Krahang (กระหัง, a male ghost that flies in the night) for instance. These spirits have the ability to possess people and can even kill a person and devour his viscera. Hence, it does not come as a surprise that the majority of good spirits are referred to as individual ghosts whereas the evil ones are categorized in groups. The benenvolent spirits are supposed to assist and protect the living. In return the good spirits receive offerings and sacrifices made by people. In this way, the spirit has to be pleased so that it will help people. Hence, we may speak of a reciprocal relationship between the spirit world and human beings. As far as the malevolent spirits are concerned, people often make an offering first in order to pacify the spirits. If that does not work, the assitance of the benevolent spirits is needed. Thus, it might also be the case that Buddhist rituals are necessary to pacify the malevolent spirits. What is more, it is a general belief that if human beings behave badly and disrespectfully towards a good spirit, this ghost might turn malevolent. Hence, we may say that the distinction between good and evil spirits may not always be clear cut. 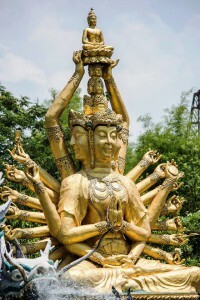 Summing up, we might be justified in claiming that generally, in Thai culture, spirits and the supernatural are very important. Ghosts are classified by their nature of origin as benevolent or malevolent. 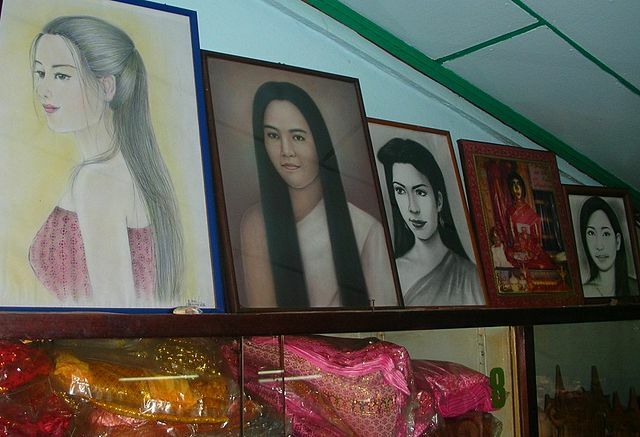 Some of them also have their own shrines for worship like Mae Nak who is the famous female ghost who died at childbirth. In Thailand, a taxi ride may be an introduction to Thai culture and belief. 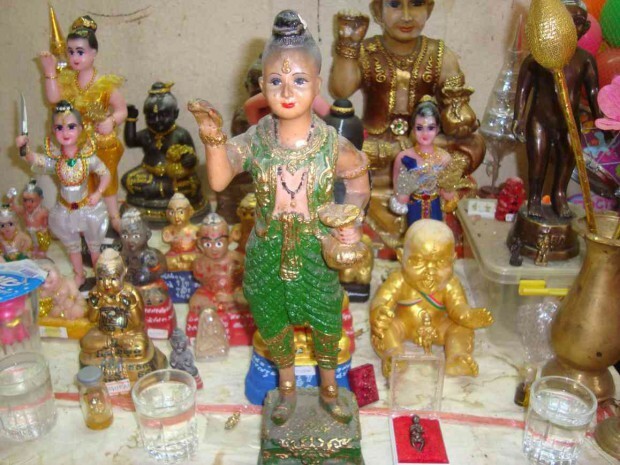 Hence, it might even become a kind of religious experience regarding all the sacred objects and talismans that Thai taxi drivers arrange on their dashboard altars. You may aks yourself the reason for these talismans. 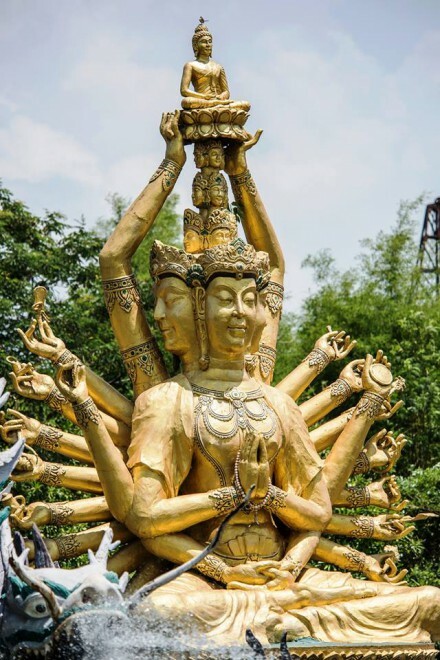 Well, since the majority of Thai people are Buddhist, they believe in karma and that each person’s fate is predertermined by previous actions. In other words, this means that what happens to a person, happens because they have caused it with their actions. Thus, Thai people to some extent believe that safety, driver’s skills and speed are not necessarily related to the probability of having an accident. In other words, if someone becomes a victim in an car accident it is because of his negative karma that has finally caused this result. Strange as it may seem to a rational Westerner, the fate of a taxi might be influenced by the spirits of the passengers that ride in it. 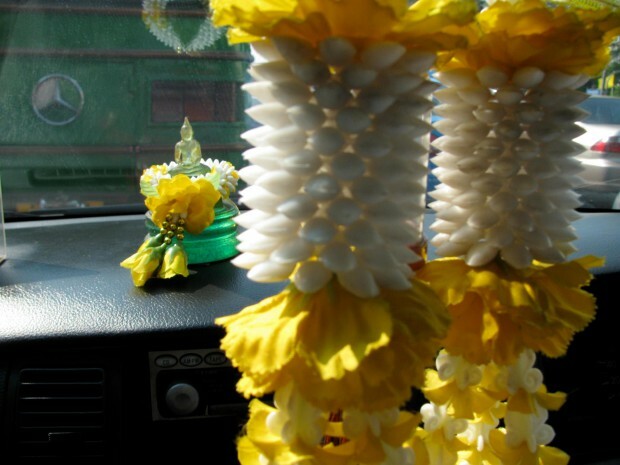 Therefore, on the one hand Thai taxi drivers turn to pok pong which is magic or spiritual protection against danger and harm and pong gun, on the other hand, to avoid accidents by minding practical safety measures such as wearing seat-belts and helmets. Nonetheless, pok pong plays an essential role to counter the negative influences radiated from the passengers. Thus, taxi drivers transform their cabbies into spiritual life insurances: they decorate their dashboards with numerous talismans and amulets. To bless their car, some drivers have a Yantra drawn by a monk on the ceiling. 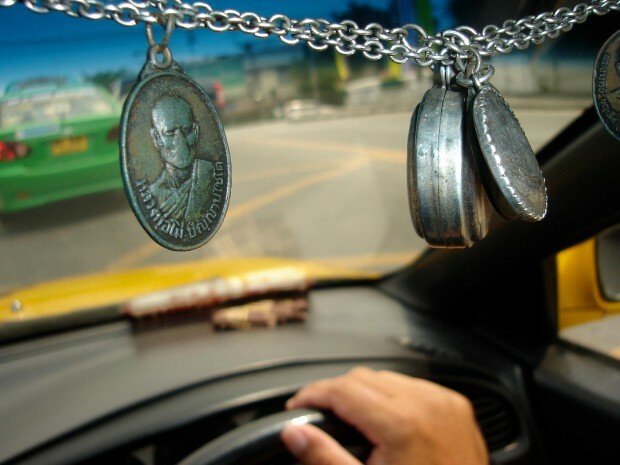 Many drivers also hang Thai flower garlands and amulets on the rearview mirror to honour the journey goddess Mae Yanang. 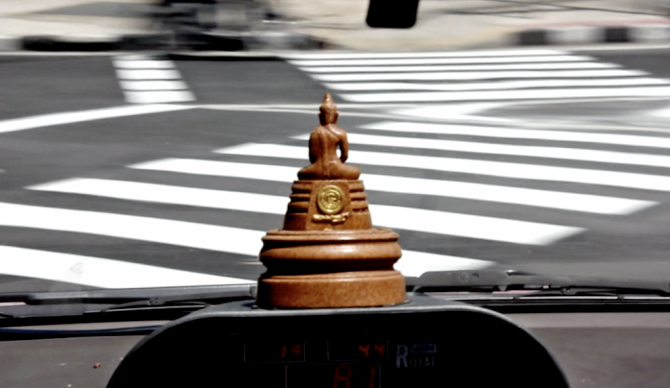 The dashboard may also harbour Buddha statues and pictures of enlightened monks and royal images that are considered auspicious. 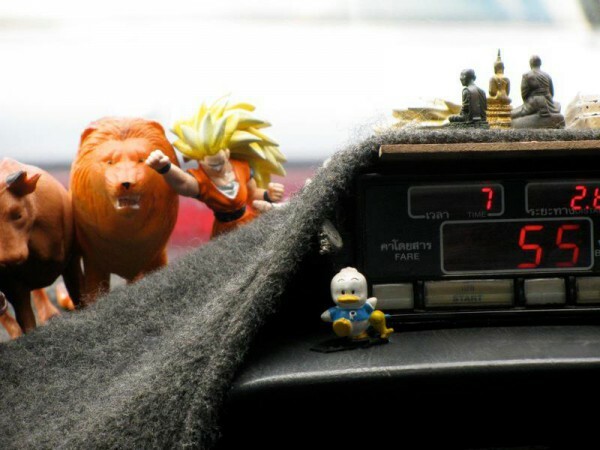 Sometimes not only the inside of a taxi is decorated but also the outside. 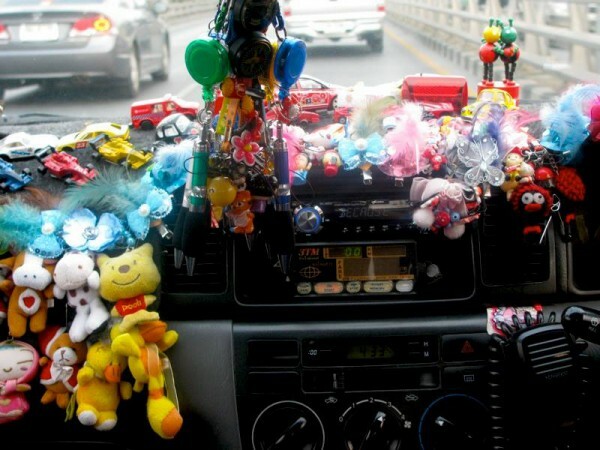 Thus, Taxi drivers may customise their cars with mascots, stickers, lamps and flags. They also serve as protections against negative karma. But well, finally it’s all about driving good and safe 🙂 Thus, ‘Kup rod dee dee’ whereever you go! 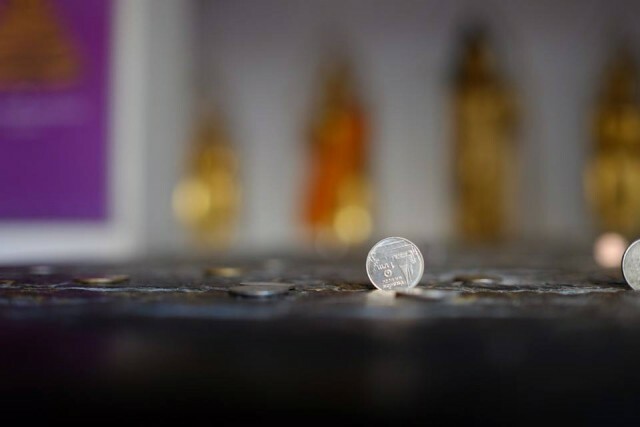 In a nutshell, we can say that Thai taxi altars & talsimans are really special since they reveal a lot about Thai culture, auspicious belief and mentality. 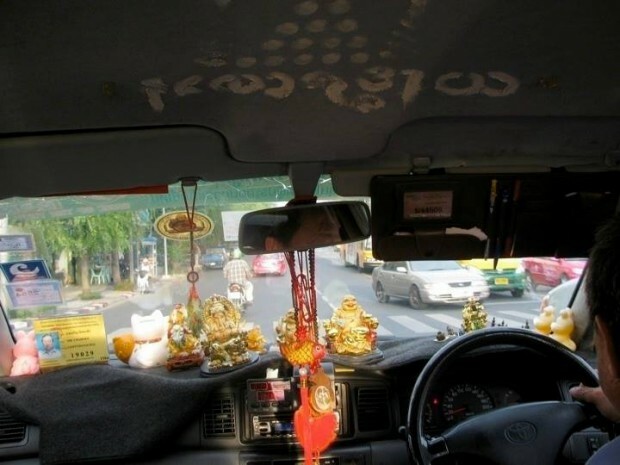 Hence, riding a taxi in Thailand can become a spiritual experience. 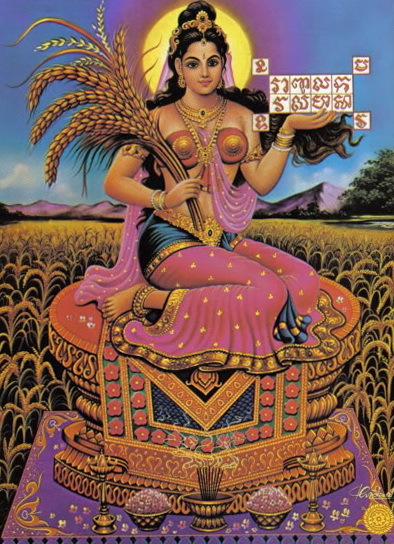 Dale Konstanz, Thai Taxi Talismans , Riverbooks 2012. Philip Cornwel-Smith & John Goss, Very Thai: Everyday Popular Culture, 2. ed. Riverbooks 2013. Mueang Boran (เมืองโบราณ) means literally translated ‘Ancient City’ and is accordingly referred to as ‘Ancient Siam’. 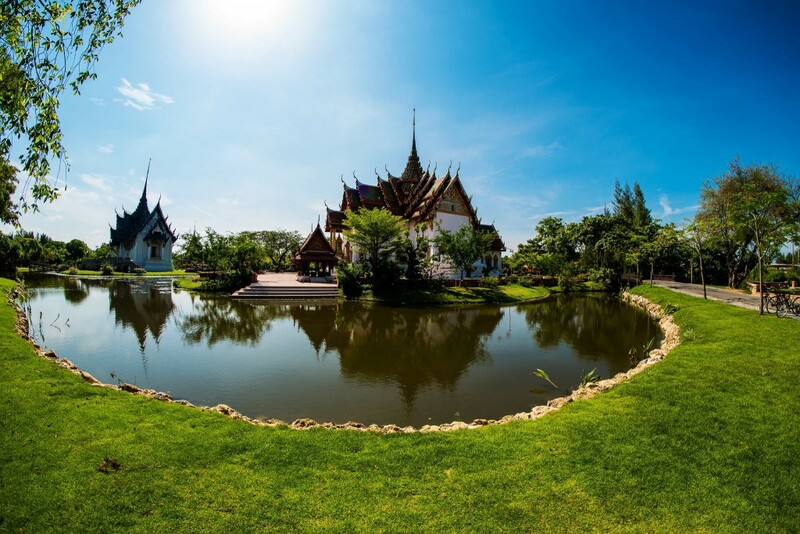 It is a park and probably the world’s largest outdoor museum created by Khun Lek Viriyaphant (1914-2000) who also constructed the Erawan Museum in Samut Prakan. 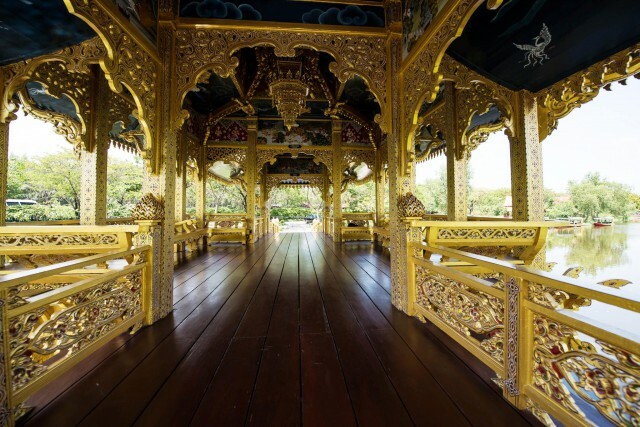 Visiting Mueang Boran can be compared to a Thailand-round journey within a day! 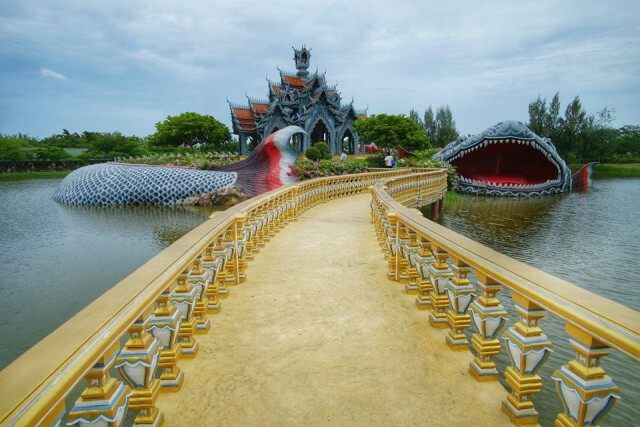 Mueang Boran, created in the early 1970s, is also located near Samut Prakan in close proximity to the Crocodile farm, about 30 km south-east of central Bangkok, near the coast to the Gulf of Thailand. 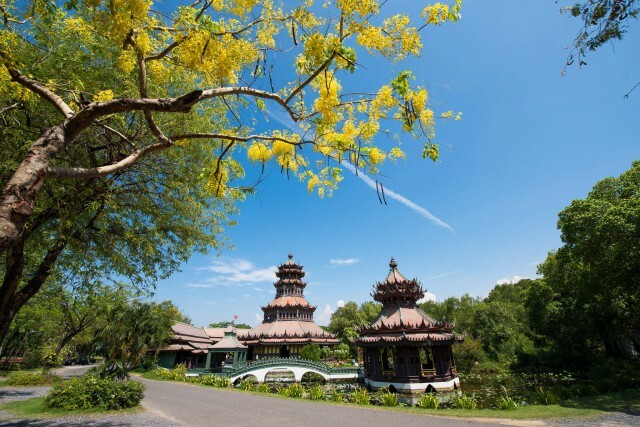 This museum park has the shape of Thailand and spreads over 200 acres. What is more, it features 116 miniature structures of Thailand’s famous monuments and architectural attractions of various provinces such as Prasat Hin Phanom Rung, Wat Mahathat Sukhothai, Phraphuttabat Saraburi, Phrathat Mueang Nakhon, Phrathat Chaiya and many more. 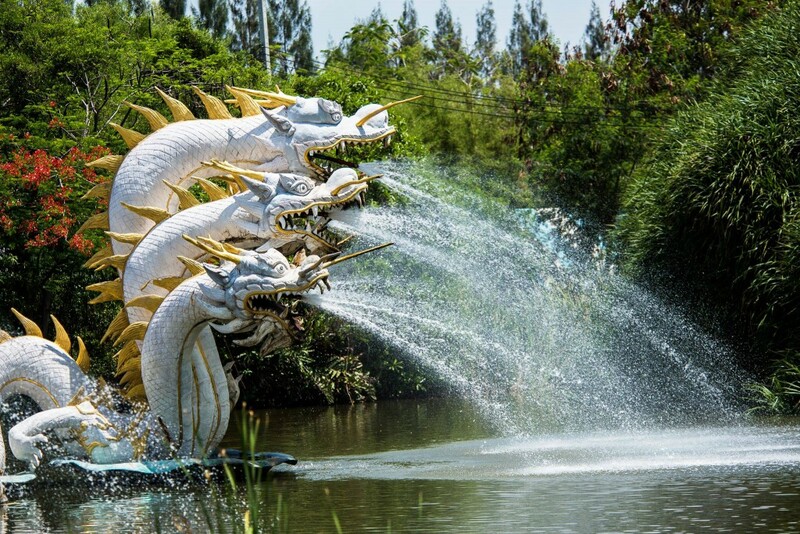 Apart from replicas of historical buildings, you may also encounter stunning mythical beings from Thai culture like the Naga which is the mythical snake. 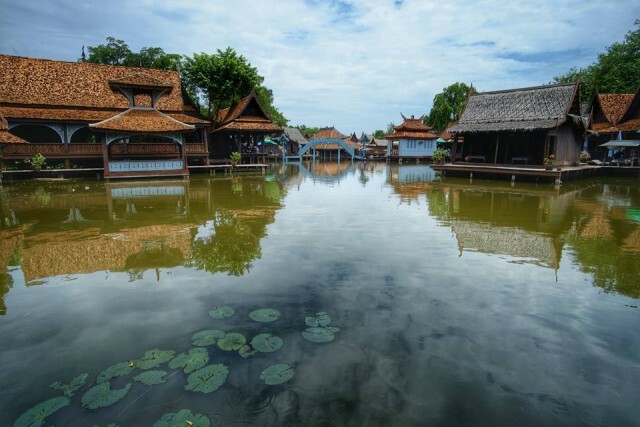 Hence, historical structures are saved in this way and the park can be regarded as an educational area preserving Thai culture and historic building techniques. 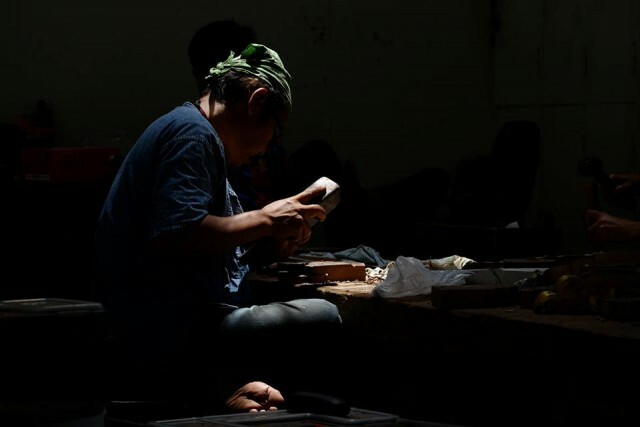 A dedicated team of local artisans work alongside experts from the National Museum of Thailand. 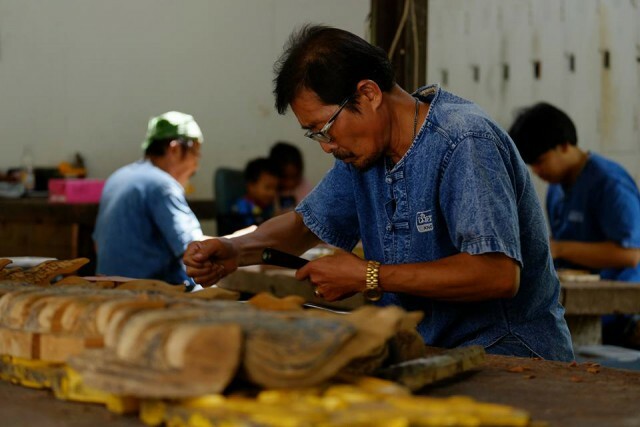 Hence, you also find woodcarvers and other craftsmen at work there. However, not all buildings are miniature, there are also some full-size replicas of existing or former sites. The facsimiles have been created with the help and assistance of experts from the National Museum in order to ensure historical accuracy. The most outstanding structure of the Ancient City is the Grand Palace of Ayutthaya which was destroyed by the Burmese in 1767. Further extraordinary replicas are the Phimai Sanctuary in Nakhon Ratchasima, and Wat Khao Phra Viharn located on the border to Cambodia. In the museum park, there are artificial watercourses and mountains. Sometimes you can also spot some shy red-deers that browse the green areas. 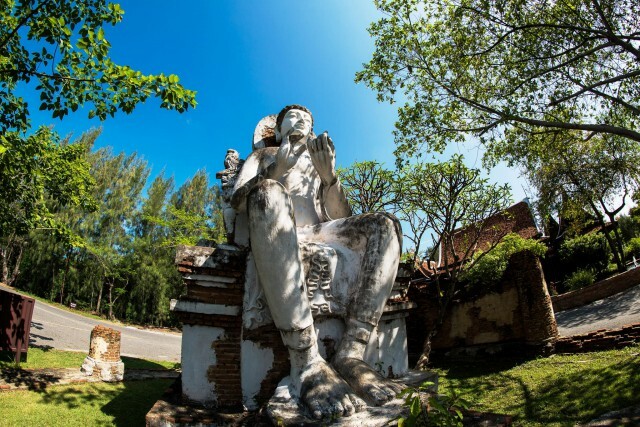 Apart from the 116 monuments, there are many statues which represent famous incidents in Thai history or literature. 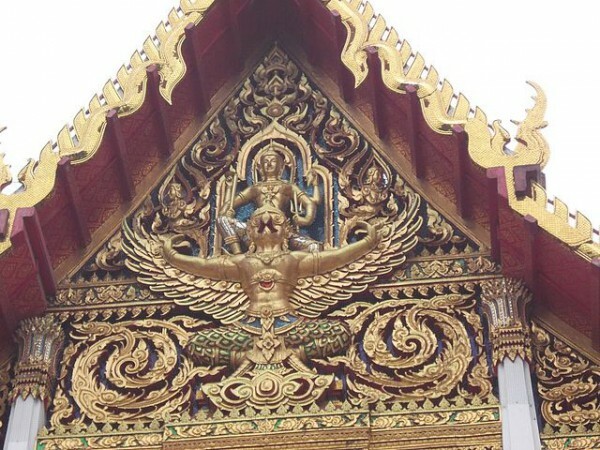 For instance, the following picture shows the Dvaravati Buddha at the Stupa of Phra Maha That, Chaiya, Surat Thani. 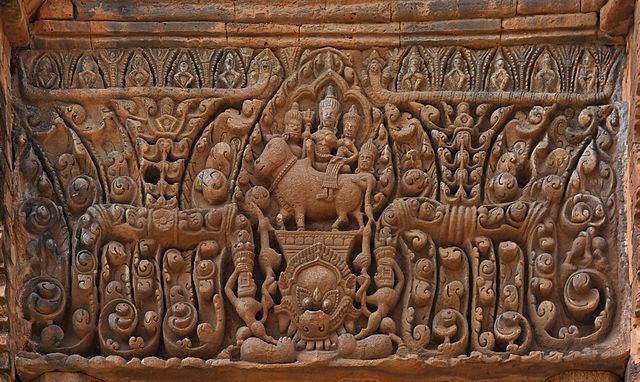 Generally, the museum presents different periods of Siamese craftsmenship ranging from prehistorical times, Dvaravati, Srivichaya, Khmer to Lanna, Lan Chang, Hariphunchai and Sukhothai. 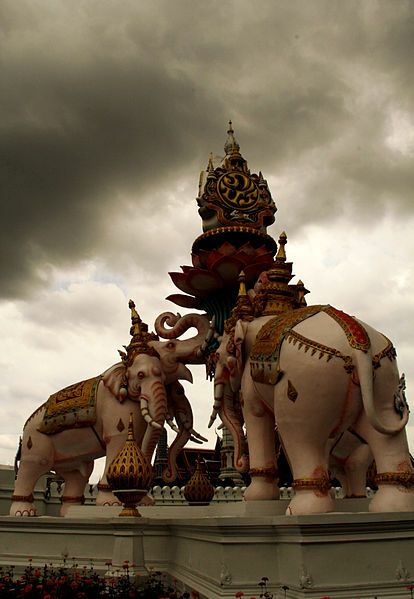 The following periods called Authong, Ayutthaya, Thonburi and Rattanakosin are also represented there. If you wonder how to move around the large park area, you may hire a golf cart or a bicycle. In addition, private vehicles are also allowed at a fee. Finally, we may claim that the Ancient City is an extraordinary outdoor museum that brings Thailand’s history under one roof. 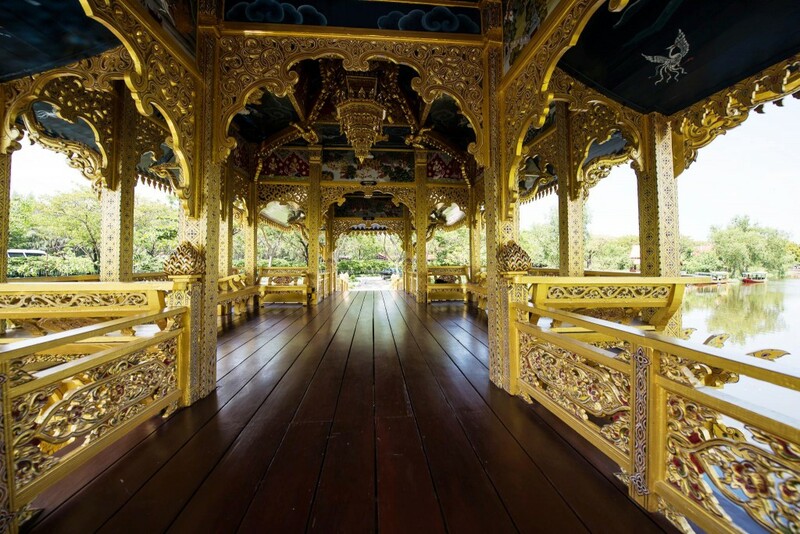 Hence, this park also helps to preserve Thailand’s rich cultural heritage. 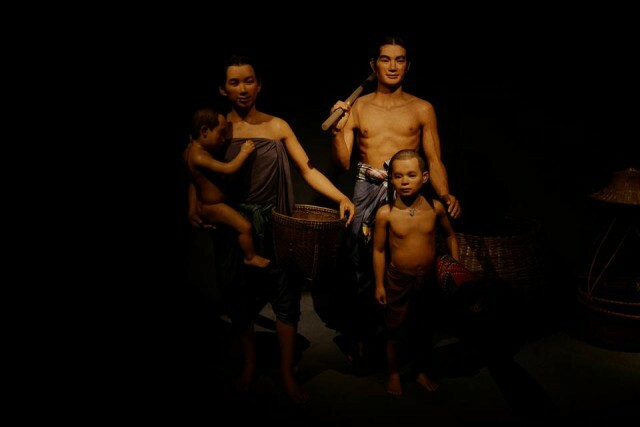 The Thai Human Imagery Museum (พิพิธภัณฑ์หุ่นขี้ผึ้งไทย) is the first museum of fibreglass models in Thailand. 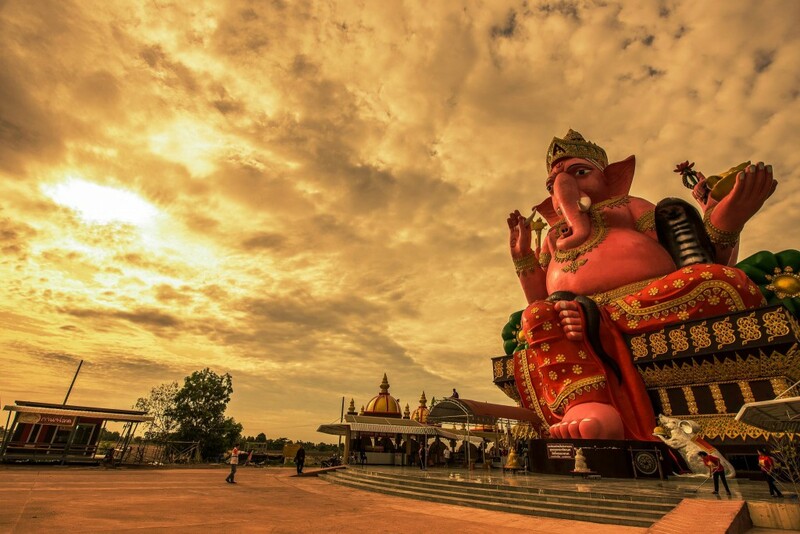 It is located in Nakhon Chaisi, Nakhon Pathom Province, Thailand. In fact, it is not exactly a wax museum since the models are all created from fiberglass. The reason for this is the hot tropical climate of Thailand. All models look amazingly authentic in every part of their bodies, including skin, limbs, eyes and even hair. 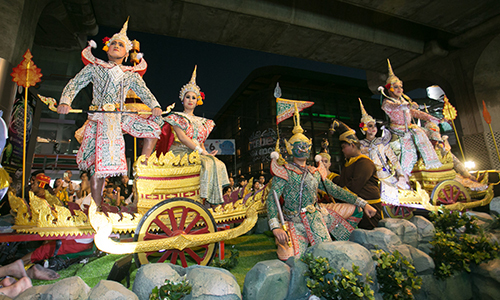 The figures mainly depict scenes from Thai life and culture from past to present. For instance, there are representations of the daily life of farm labourers, slaves, gamblers and even a man reading a Thai newspaper. 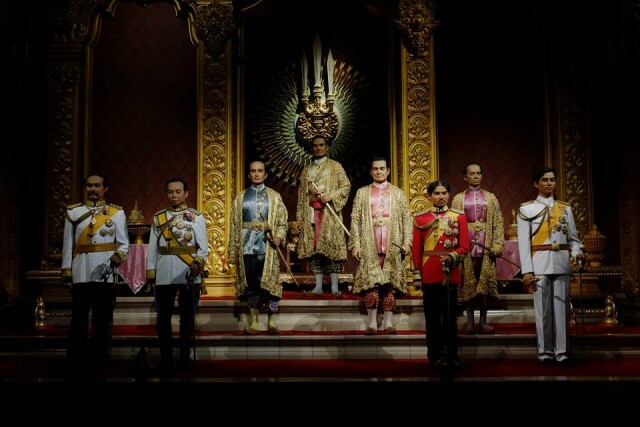 What is more, there are various Thai history sets. 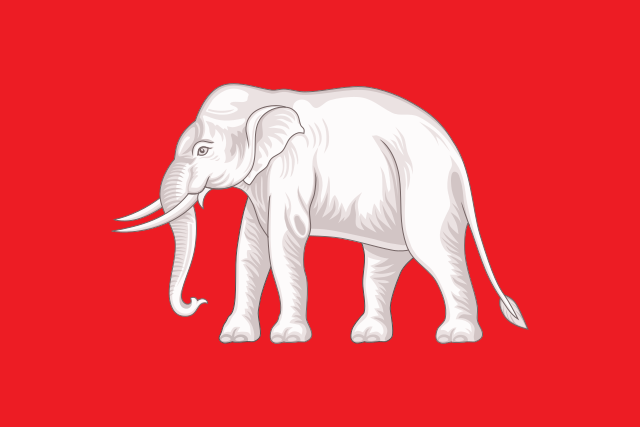 Among them are for example the Chakri Dynasty Kings. 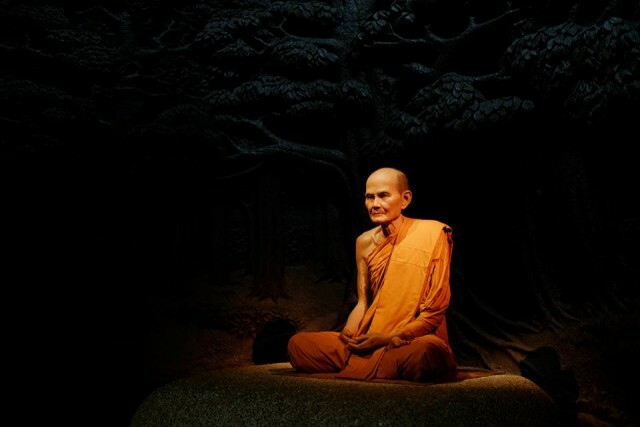 Furthermore, there are models of famous enlightened monks, poets, politicians, aristocrats and artists. 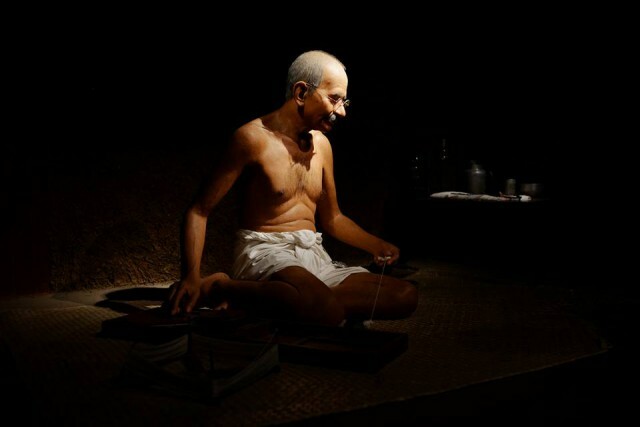 In addition, some prominent foreigners of history can also be found there, among them for instance Mahatma Gandhi. This museum was created by artist Duangkaew Phityakornsilp and a group of Thai artists. They spent more than ten years creating the life-like fibreglass figures. Their aim was to promote and conserve Thai tradition, art and culture (‘Thainess’) for future generations. Thus, I would like to focus on some highlights of the exhibition. 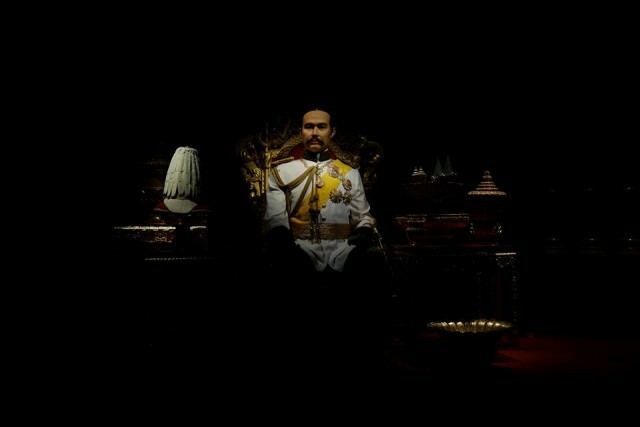 These are the Royal Images of Chakri Dynasty King Rama I – VIII. 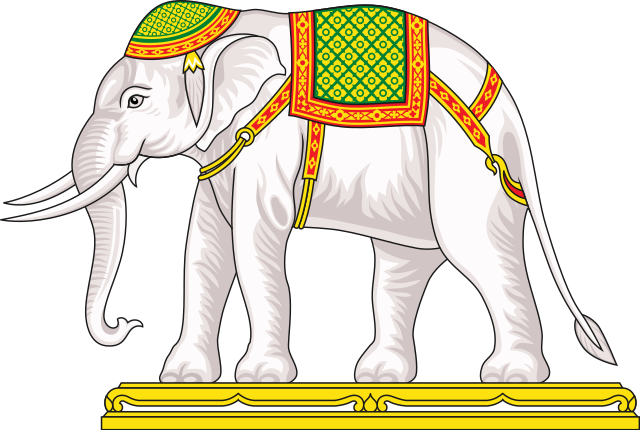 The first King, Phra Buddha Yodfa Chulaloke, who was the first Chakri Dynasty King, established Bangkok as the capital city of Thailand in 1782. In 1868, Chulalongkorn was coronated at the age of 15. He was determined to abolish slavery. Hence, King Chulalongkorn bought a number of slaves with his own money and set them free as gesture of goodwill so that his subjects might follow his example. Thus in 1905, he declared the end of slavery in Thailand. It took 37 years to achieve this noble aim. The museum also introduces traditional Thai games. Thailand is known for many games such as the famous Manohra Play, Kite Flying, Post Seizing Monkeys (Ling Ching Lak) and Fish Entering Net (Plaa Long Uan) which date back to the Sukhothai period. Among the young, these games are still popular even today. 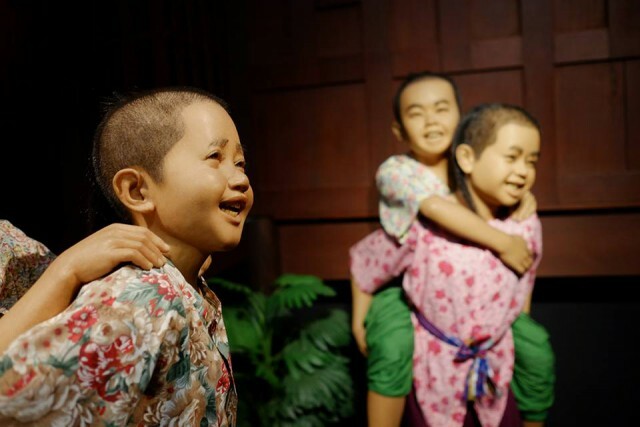 Additionally, the museum presents four sets of Thai traditional children’s games which are called a’ree-ree khao sarn’, ‘maeng mum’, ‘cham chee’ and ‘khee chang chon kan’. 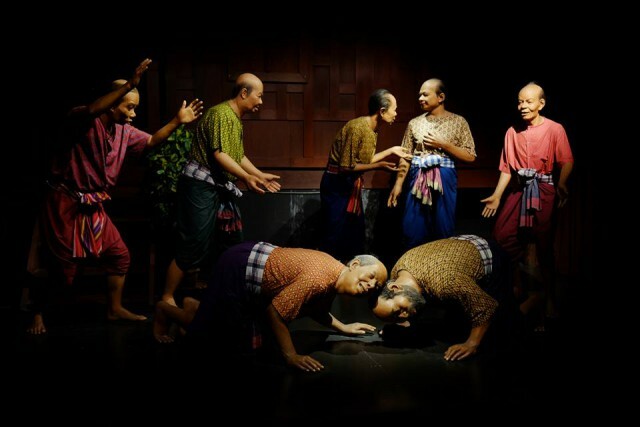 There are also traditional Thai games for adults such as ‘Bald Head Smashing’ (“Hua Larn Chon Kan”). This game is very old and recorded in the “Sumudkhot Kham Chand”, a noted Thai literary piece from the age of King Narai. However, the museum is also concerned with arts. 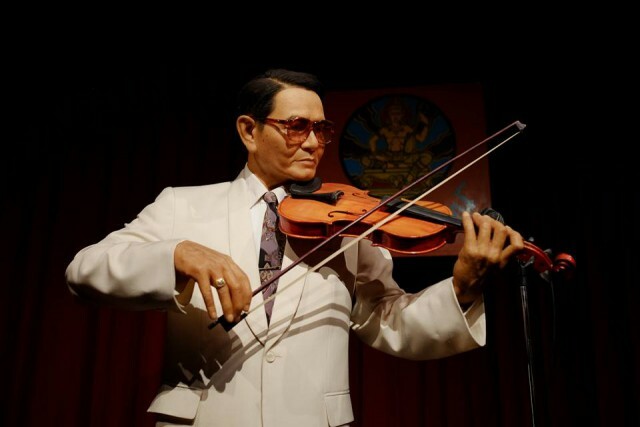 For instance, you find there a figure of the famous musician Khru Ee-ah Sunthornsanan. He was the first leader of the Musical Group of the Publicity Department. His songs became very popular by the name of “Suntharaporn”. 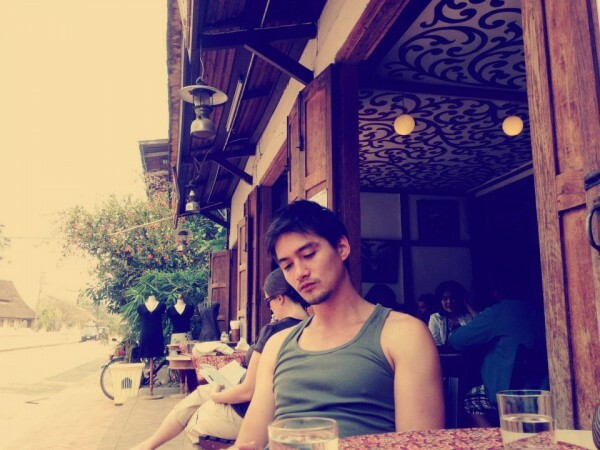 Sabaidee Luang Prabang (Good morning, Luang Prabang, 2008, directed by Sakchai Deenan) is a romantic drama movie starring Thai movie star Ananda Everingham who is of Lao-Australian descent. The special feature of this film is that it deals with the relationship between Thailand and Laos. What is more, it is also the first Thai-Laotian commercial film since 1975. In my view this is a special and beautiful movie because it shows the amazing landscape in Laos. 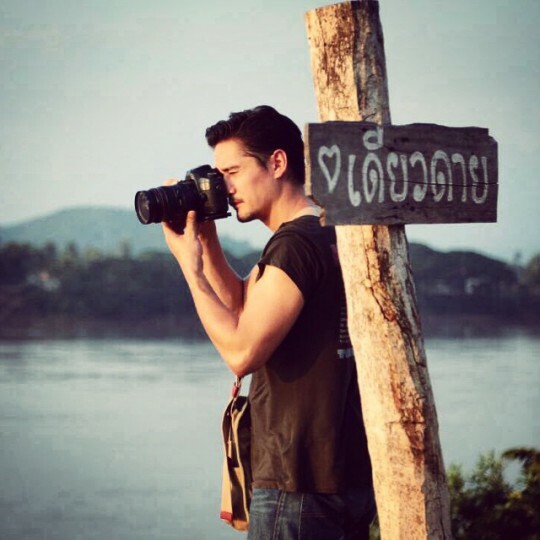 The plot of the movie is relatively simple: Sorn (played by A. Everingham) is a Thai photographer visiting Laos. There he falls in love with his lovely Laotian tour guide, Noi (Khamlek Pallawong). 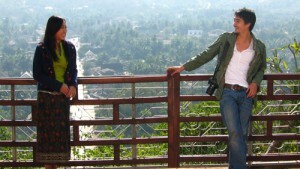 The film features and focusses on several tourist sites in Laos and points out the differences between Thailand and Laos. This contrast is already depicted in the trailer to the movie. 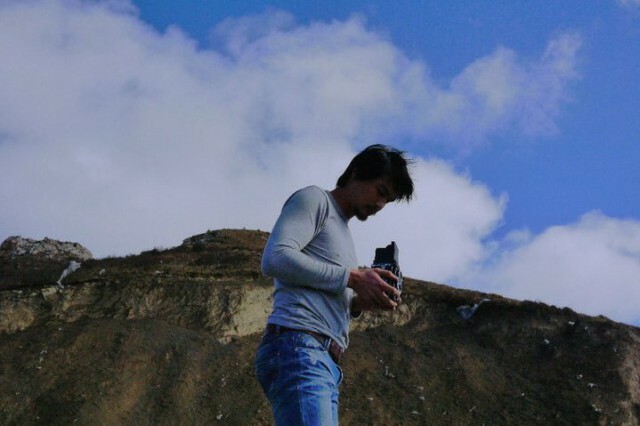 In fact, the film is shot primarily outdoors, thus using a kind of road movie approach. 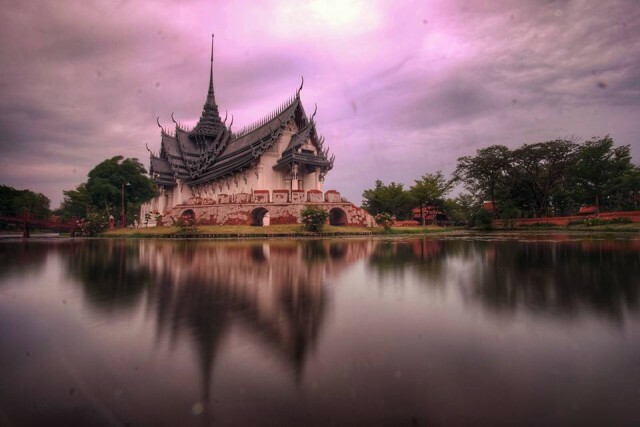 The settings in Laos contrast sharply with Bangkok because the latter is presented as a hectic metropolitan city whereas life in Laos appears to be more calm and harmonic. 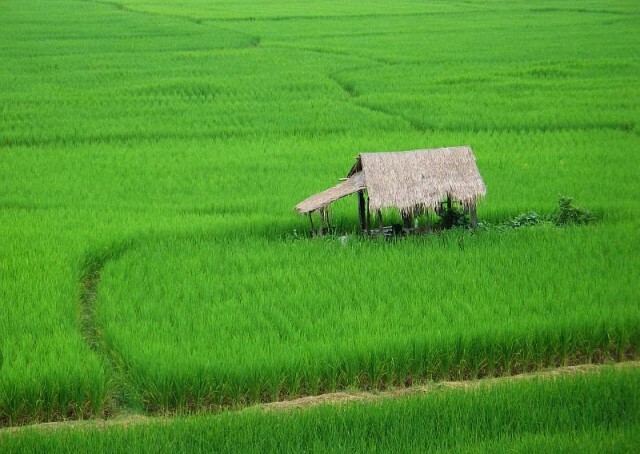 In addition, the Laotian scenery is green, pristine and unspoiled by modernity. The first part of the movie presents the protagonist Sorn as a small creature surrounded by the city skyline in Bangkok. 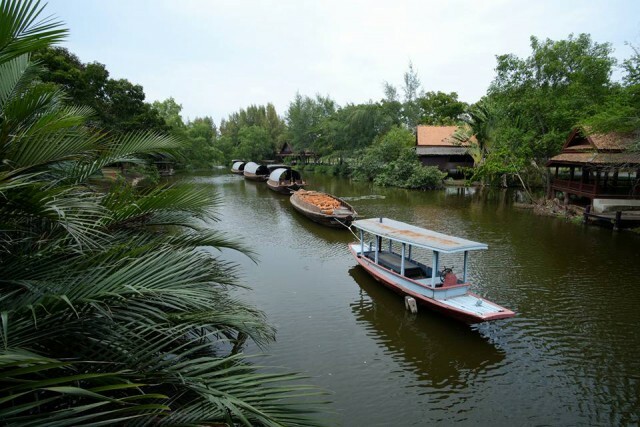 However, in Laos, Sorn experiences an easy atmosphere of small towns where people have a simple lifestyle and are still connected with their local traditions. Luang Prabang, which is also a world heritage site, is the central motif of the movie. Hence, it appears in the film title and it is the place where the protagonists move around at the end of the movie, showing the natural and historical sites of the town. Thus, the audience gets the impression of Laos being a place unspoiled by modernity compared to Bangkok city. What is more, the untouched towns stand for a kind of utopian space where everyone lives in contentment. Even though the settings in Thailand and Laos are opposed to each other, the movie also stresses similarities between Thai and Lao culture. For instance, the title of the film points out a similarity but also a difference between Thai and Lao language. In Lao, Sabaidee Luang Prabang means Hello Luang Prabang whereas in Thai it will rather say I’m fine Luang Prabang or in interrogative sentence ‘How are you?‘. 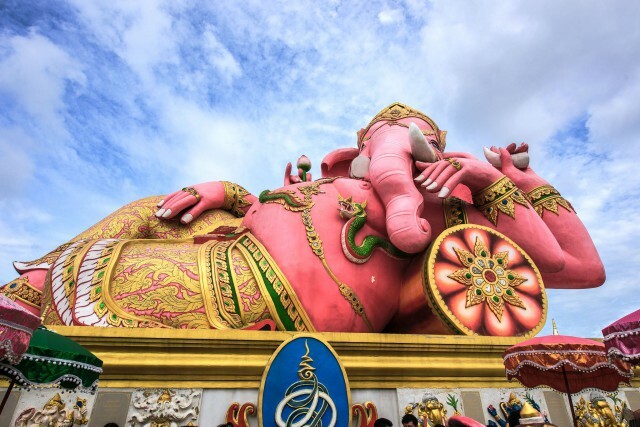 However, although the literal translation of the title is not identical in Thai and Lao, the word ‘Sabaidee’ is understood as a greeting in both cultures. What is more, there are many tourism elements in the movie that seem to encourage the audience wanting to go to Laos. For example, every time Sorn and Noi move from one town to another the caption will be shown ensuring that the audience knows where the place is. Sometimes it is also explained in the movie how to get to the respective places. 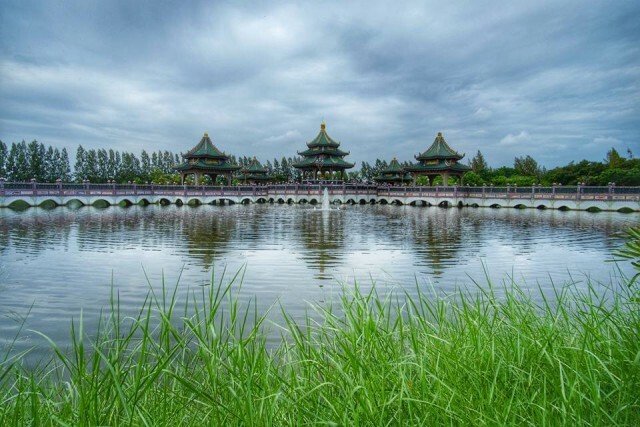 In addition, since Noi is a tour guide she often explains about natural and historical places to Sorn who is a photographer and thus captures the beautiful scenery on his photos. Thus, the film title and the intact scenery shown in the movie make it to a kind of ‘tourism film’. Today’s media review is about Thai Ways by Denis Segaller (ISBN: 9789749575734 ). This book was published in 2005 by Silkworm Books, Chiang Mai, Thailand. The book is in English language, comprises 254 pages and is available as print version and e-formats (iBooks, Kindle, Google Books and Kobo). It costs 395 Bath, on Amazon the print version is about 15 EUR. You may take a look inside the book here. Thai Ways written by Denis Segaller (b. 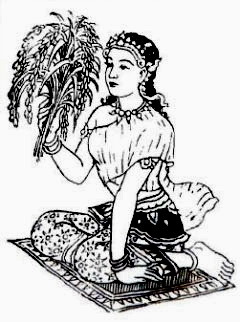 1915) can be regarded as a delightful collection of stories and tales covering nearly all aspects of Thai culture, customs and beliefs. Segaller came to live in Thailand at an older age in 1965, married a Thai lady, became a Buddhist and worked as a writer for the Bangkok Post among others. ‘Thai Ways’ comprises many of Segaller’s magazine articles that were mainly published, updated and completed during the 1970s in the popular weekly column ‘Thai Ways’ in the ‘Bangkok World’ which was the former afternoon tabloid companion to the Bangkok Post. The weekly ‘Thai Ways’ column ran continuously from 1975 to 1985. In short articles and anecdotes, the author describes Thai culture very comprehensively and accurately. Even though the selections are about four decades old, they nevertheless remain as informative today as when Segaller first wrote them down. The book starts off with a preface and a note about the spelling of Thai words. ‘Thai Ways’ has ten chapters which are each divided into several sections. The chapters are about ‘Royalty and Nobility’, ‘Festivals’, ‘Ceremonies’, ‘Customs’, ‘Beliefs and Superstitions’, ‘Legends’, ‘Families’, ‘Thai Fortune-Telling’, ‘Names, Words and Language’ and ‘Miscellaneous’. 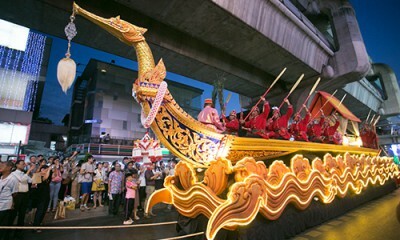 Segaller covers numerous aspects of Thai culture and customs, thus demystifying constructs like the system of royal ranks and the Thai musical scale, and customs like the Loi Krathong festival and the Wai Khru ceremony, for instance. In my view, the book is a gem of information that provides insight into the heart, mind and social structure of an Asian country not to be subjected to the culture of colonial rule. It probably provides more information than the typical tourist wants to know. However, for anyone who has personal, economic or diplomatic interest in Thailand it is a source of important insights. The book might seem a little dated, nevertheless it offers a deep understanding of how Thailand has developed and functioned on many levels. 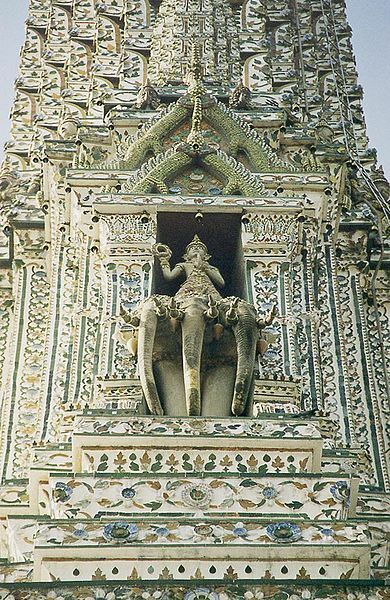 Finally, I can highly recommend Thai Ways by Denis Segaller because it is comprehensive and provides you with a picture of Thailand that the non-Thai readers are not likely to encounter elsewhere. In addition, it should be noted that there have been two subsequent publications titled “More Thai Ways” and “New Thoughts on Thai Ways” which offer additional topics presented in a similar format. What does ‘Discover Thainess’ mean? I’ve recently come across TAT’s (Tourism Authority of Thailand) activity ‘DiscoverThainess’ which is a contest that invites non-Thai people to engage in five different categories of activities related to ‘Thainess’. These categories are ‘Thai Boxing’, ‘Thai Cooking’, ‘Thai Dancing’, ‘Making Thai Style Garlands’ and ‘Speaking Thai’. In fact, competitors are asked to do things that are considered to be typical Thai, i.e. 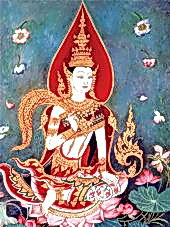 characteristic of Thai culture. Hence, I’ve asked myself what the concept of ‘Thainess’ is actually about? First of all, one might think that this is merely a Thai government campaign to become more visible and important in the tourism industry. If we are critical, we might also claim that ‘Thainess’ may be all about stereotypes concerning Thai culture. However, I also think it is a campaign to make foreigners (or using the Thai term ‘farangs’) understand what Thai culture and mentality is actually about. Nonetheless, if we try a definition of the term ‘Thainess’ we might say that it means a kind of active decency towards each other. 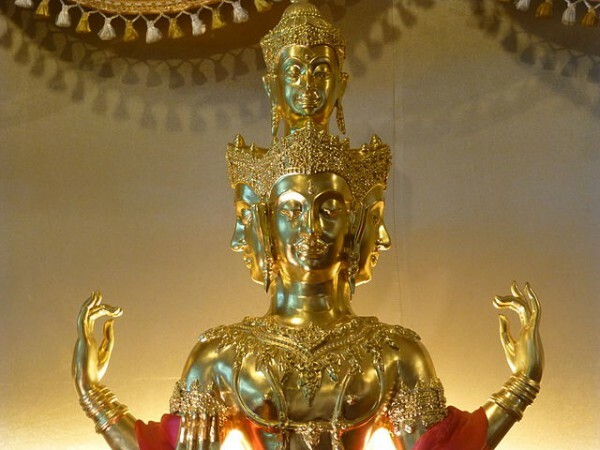 It is not merely about activities like Thai dancing or cooking but it is actually an attitude of mind. In fact, ‘Thainess’ expresses Thai culture and shows the way Thai people differentiate themselves from everyone else in the world. 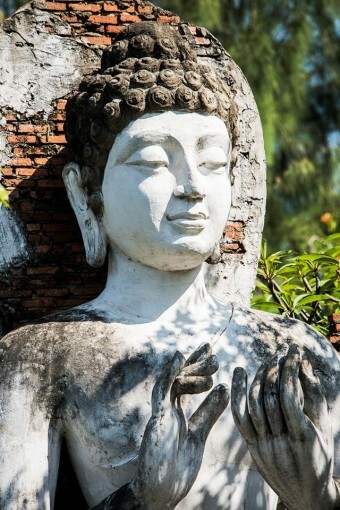 Hence, ‘Thainess’ is mainly based on the Buddhist dharma of decency and politeness. In other words, it is all about what Thai people call ‘Kreng Jai’ (in Thai: เกรงใจ). Translated literally ‘Kreng Jai’ means something like ‘awe of heart’ or ‘consideration’. In short, we might say that ‘Kreng Jai’ means awareness of other people’s feelings and thus showing respect and politeness towards one another. In point of fact, we can also argue that ‘Kreng Jai’ allows the other person to maintain his face. Have you come across the term ‘Discover Thainess’? And what does it mean to you?